In The One-Bottle Cocktail, Maggie Hoffman brings fancy drinking to the masses by making cocktails approachable enough for those with a tiny home bar. 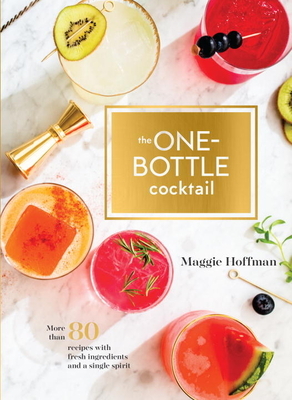 Conversational and authoritative, this book puts simple, delicious, and inventive drinks into your hands wherever you are, with ingredients you can easily source and no more than one spirit. Organized by spirit--vodka, gin, agave, rum, brandy, and whiskey--each chapter offers fresh, eye-opening cocktails like the Garden Gnome (vodka, green tomato, basil, and lime), Night of the Hunter (gin, figs, thyme, and grapefruit soda), and the Bluest Chai (rye whiskey, chai tea, and balsamic vinegar). These recipes won't break the bank, won't require an emergency run to the liquor store, and (best of all!) will delight cocktail lovers of all stripes. MAGGIE HOFFMAN writes about cocktails, wine, and beer for the James Beard Award-winning website Serious Eats, where she founded the drinks section in 2011 and served as managing editor. Hoffman has written for Wine Enthusiast, the San Francisco Chronicle, and San Francisco Magazine, as well as the websites of Saveur, Food & Wine, and others. She lives in San Francisco with her husband, daughter, and more than a few bottles of booze.